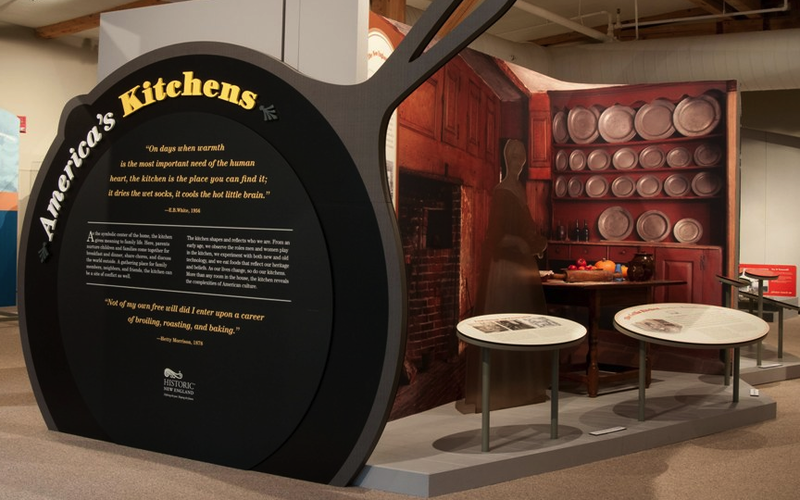 Back in January, I went to the New Hampshire Historical Society to take in a long-awaited exhibit called America’s Kitchens. Sponsored by Historic New England, this exhibit covered the entire history of the kitchen in this country, as well as recipes, cooking techniques, and most importantly, the role/s of women in these important chores. Although fairly small in scale, it featured not only print materials, but some fascinating antiques, a vintage 50s kitchen complete with appliances, and even a few hands-on displays. As a real foodie, I’d gone into the exhibit thinking this glimpse into the past would be pure entertainment. But it left me grappling with my own ignorance. Although I can recollect recounted snippets of my great grandmother’s and my grandmother’s childhood chores, they’re fuzzy at best. As a modern woman, I have never known the kitchen as anything but fun. This exhibit reminded me that until very recent times, the kitchen was anything but. Historically, cooking and kitchen work fell principally if not solely to females, and before the advent of today’s convenience technologies, the preparation, storage and keeping of food, and all associated & very necessary cleaning tasks were nothing short of grueling. It’s one thing today to make a choice to cook or clean, but back in the day, women (unless they were wealthy) had NO CHOICE. Sun up to sun down was devoted to maintaining fires, tending to livestock, working fields, preparing food, feeding families, raising children – and by raising I mean everything involved with their upbringing, be it nursing, changing, teaching, playing, and so on. 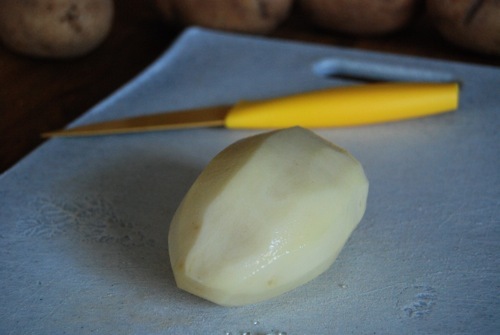 All day long there was cleaning to be done, not to mention seasonal activities, like canning, pickling, the smoking and salting of meats, butter making, and more. And let’s not forget other important tasks like the making and mending of clothes, along with their maintenance. Laundry alone would take hours of backbreaking labor. The Whirlpool Corporation (well, technically its predecessor) wasn’t even founded until 1911!! Women Worked (with a capital W) all day, every day, until they finally dropped dead of exhaustion. Rarely was there expectation of eventual betterment or any other role to fill. Home life for our predecessors was more than thankless; it was mandatory indentured servitude. No wonder women were so eager to escape! 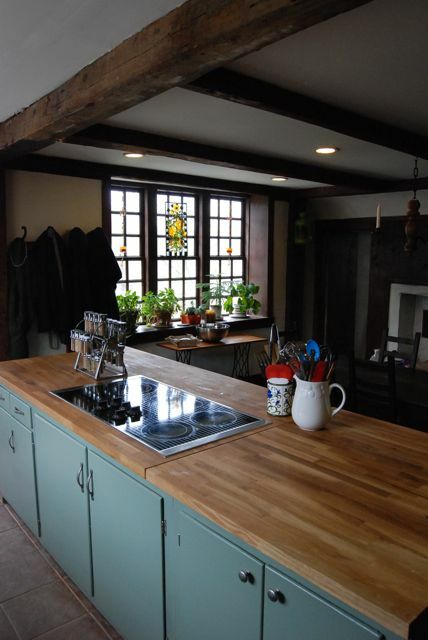 The kitchen was and is the heart of the home, but historically it was also a place of undeniable struggle. Against hunger, against nature, and against gender roles. While some women embraced their expected place, you can understand why others railed against it. Choice, my friends, can make even unappealing tasks palatable. Which brings me to another interesting point raised by the exhibit. When American housewives had the finance and good fortune to pass their labor onto others, they happily did so, in the form of paid servants and unpaid slaves. Interesting to note how often these unburdened women were quick to complain about the poor performance of those toiling on their behalf. Many modern women, such as yours truly, complain about having to do simple household chores. We gripe about having to push a vacuum across the floor or wipe down counters with magical germ killing cleaners. We grudgingly toss clothes into big shiny machines which do ALL THE WORK FOR US. In comparison to what our forebears had to slog through daily, we’re a bunch of pampered pansies. But even now, some women struggle just as they always have. They wash clothes by hand in filthy streams, they draw water from wells, carrying it miles back to their homes – often with their children in tow. Women are still scraping by, cooking meager food, making clothes by hand, even here in America. Fortunately, most of us reading this have a choice. 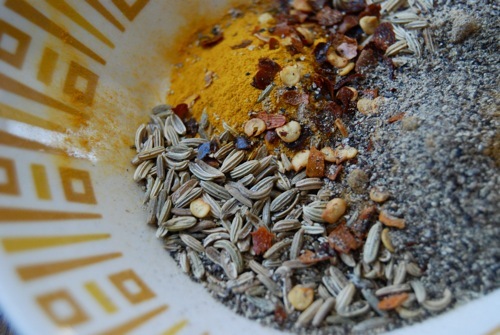 Whether you love or hate the kitchen, you’re not bound to it. 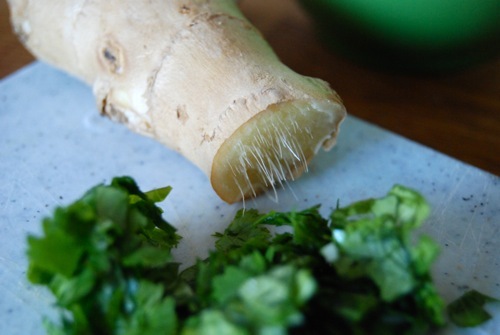 In 2010, women have the luxury of opting out of cooking altogether if they so desire, and some do. I wonder about the women who used to work in these walls. I envision them laboring in front of the open hearth, baking bread in the beehive oven, having to constantly maintain the fire. How exhausting it must all have been. It makes me further appreciate all of the advantages I do have, circa 2010. Like my beautiful new appliances! Which do EVERYTHING FOR ME, including cool, cook and clean.. God bless them. Feast Your Eyeballs on THIS! My dear pal Curly is a woman of requests. Last month she made me disclose the world’s worst candy. Now she wants to take a peek inside my fridge. I almost shudder to think what she’ll be asking of me next.. BUT since we’re pals..
TAAA-DAAAAAHHH! OoOoohhhhh..Isn’t he handsome.. YES he IS! Before you get too jealous, though, I must confess. This is not MY fridge. No. It belongs to my landlord. But I pretend it’s mine. PS: If you want to store the contents of your lunch in MY fridge, you must ask first. Let’s take a look inside..
And is a delightful purple-blue. But now that my blueberry milk has turned a pallid WHITE I am thinking that’s not too good. From the photo, it also appears to be separating. Oh my. Note to self: remove blue white blueberry milk. PS: remember to turn head while pouring out. PPS: Now that there is space; buy more wine. Here is my landlord’s freezer. YES, we do like ice cream! In fact, we LOVE it!! Except that spangly stars n’ stripes kind, which I can’t get my kids to eat. They do like those frozen fish sticks, though. YOU TOO?? Well.. I’ll ask, but I’m not sure they’ll share. You can always come over for some stars n’ stripes ice cream, though. Or a nice glass of milk. Yogurt. The stuff of legend. Well.. maybe not, but to me.. yogurt is T-RRIFIC. This weekend while visiting w/ my sister and her FABBBULOUS new boyfriend, we got to talking about yogurt. And I finally decided to do something I’ve always wanted to do. 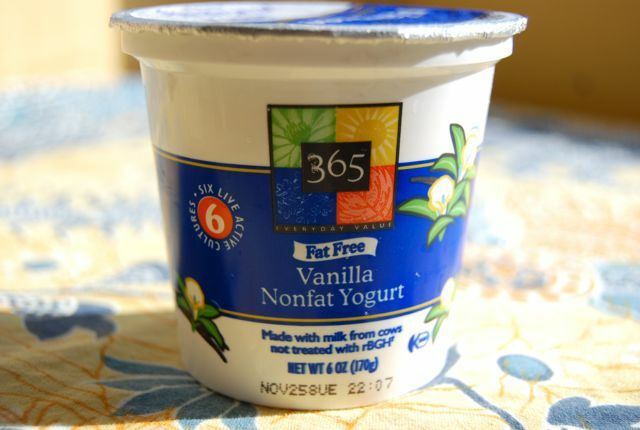 NAMELY, hold my very own taste test… of YOGURT! YAY!!!!!!!!!! I eat enough of the stuff to support at least one company in the style to which they’ve become accustomed. (I am talking to YOU Stonyfield.) BUT why limit myself? I am a woman of adventure, of daring, of DAIRY! There are dozens of yogurts out there on the market, just waiting to be sampled. Most manufacturers produce some sort of vanilla. I excluded non-cow’s milk (soy milk, goat’s milk, coconut milk) to be fair. And to hedge against varying levels of milk fat across low fat or light brands, I opted for FAT FREE products. Finally, I decided NOT to taste test any yogurts containing artificial sweeteners – b/c I hate them and this is MY CONTEST. 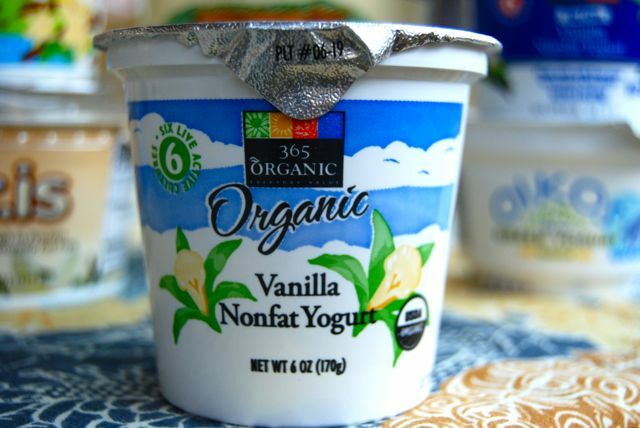 Although most of the yogurts are organic, a few are not. I decided to include conventional (aka, NON organic) yogurt for two reasons. One. Although there is normally a price differential associated with buying organic (i.e., it usually costs more), this was not necessarily the case here. I wanted to see why. Two. I felt comparing organic and conventional yogurts would add yet another level of interest to the experiment. YES we all know that organic yogurt is better for you, but does it also TASTE BETTER?? Curd for curd, my goal in this GREAT YOGURT TASTE OFF! was to find the best tasting, best value nonfat vanilla on the market. NOTE: In an ideal world, I would have been able to find all of the yogurts in single-serving 6 oz. cups. Unfortunately, after hauling it to 5 stores I took what I could get. BUT YOU GET THE IDEA. Now onto the results. Good texture. Slightly thick, yet smooth and creamy. Reminds me of Stonyfield’s subtle sweetness, but with a touch more vanilla flavor. This is a yummy yogurt I would definitely buy again and recommend to others. This has been my go-to yogurt for years. 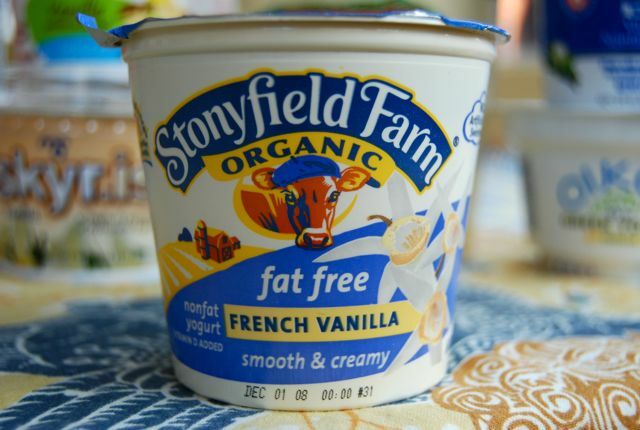 I still love Stonyfield’s thick (almost chunky) appearance and very smooth & creamy texture. By comparison it is much less sweet than competitors, with only a hint of vanilla. Just how I like it. Top marks for this delicious organic yogurt, with its smooth, light and creamy texture. This one is a bit sweeter than Stonyfield, with a more discernible vanilla taste. Highly recommended. It’s hard to believe this yogurt’s fat free! TONS of vanilla flavor in a very sweet, rich and creamy base. This yogurt is perfect for those craving decadent desserts while dieting. A little sweeter than I’m accustomed to, but delicious all the same. Recommended. This yogurt is not cheap, though it was the least expensive of the three Greek-style yogurts sampled. I read a bit about Greek yogurt before undertaking this experiment, both to educate as well as prepare myself for what it would be like. 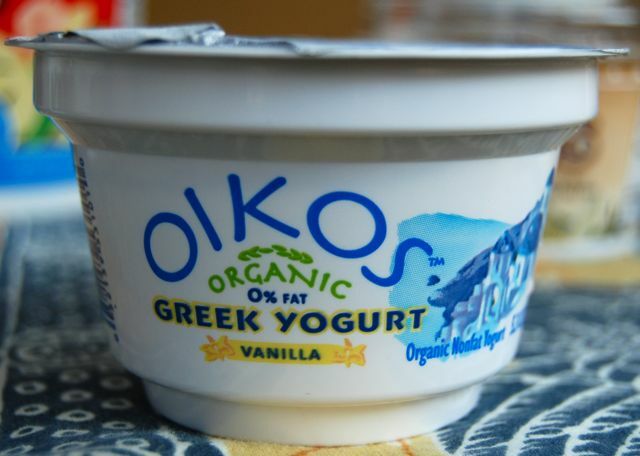 I agree with most reviews which describe Greek yogurt as chalky and unappealing. 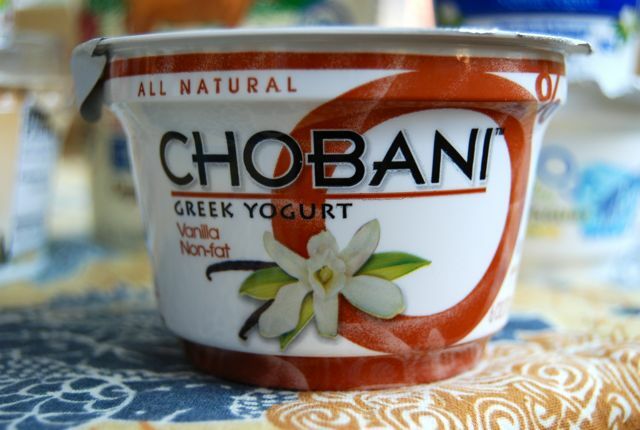 Both adjectives can easily be used to describe Chobani, as well as unbelievably thick, not sweet, with no discernible vanilla flavor. Do not buy this unless you enjoy Greek yogurt or need cheap glue. I am not sure how to describe this yogurt. I took one bite and UGH!!!! actually had to spit it out. It had a very pronounced sour “yogurt-y” taste. Almost too much to believe. Until I looked more closely at the cup and realized it was actually expired by THREE WEEKS. Way to sell me that Oct 28th yogurt on November 18th, Whole Foods. I will not be going back for another. 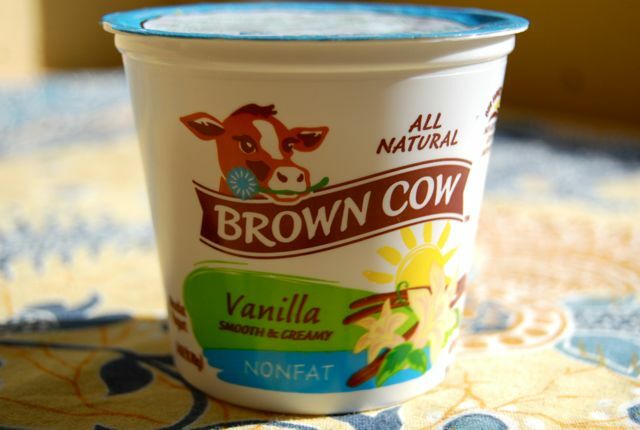 This Australian-style yogurt is actually manufactured in California. Having never been to Australia, I’m not sure what difference there is in our yogurts, except to say this had a smoother, more blended feel. 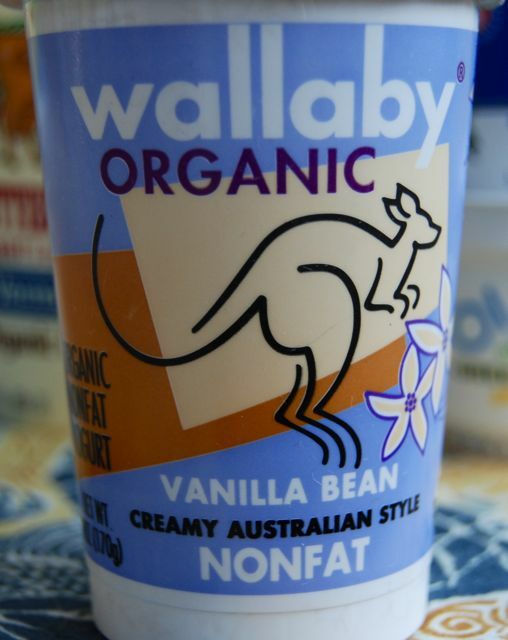 This was one of only two yogurts to have any visible vanilla bean specks, and Wallaby had by FAR the strongest vanilla flavor of any yogurt sampled. Check and check. Unfortunately, it was also extremely sweet, with a flavor reminiscent of Kaopectate. I will not be buying this one again. This Greek-style yogurt is made by Stonyfield Farm, which might account for my liking it slightly better than the other two I tried. It had a much lighter consistency – almost whipped – which made it mildly appealing, though in flavor I’d be hard pressed to distinguish it from plain yogurt. Very little sweetness and virtually no vanilla flavor. Not recommended. FOUR WORDS: UNBELIEVABLY THICK AND EXPENSIVE. This was the priciest yogurt by far, and not even organic. Granted, it’s a Greek Style yogurt manufactured in Iceland. But even that can’t make up for it. I want to label this yogurt a novelty – it even comes with its own very nifty snap-shut spoon, but frankly save your $2.79. The yogurt is, as I said, incredibly thick, with a soft cheese consistency. 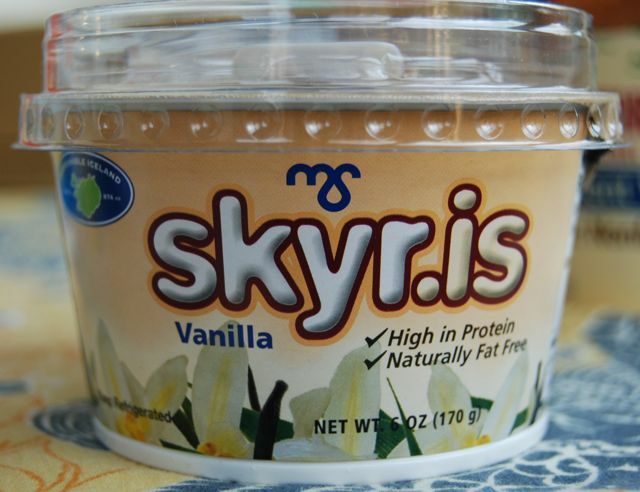 To its credit Skyr.is was the only other yogurt besides Wallaby to have visible vanilla bean specks. 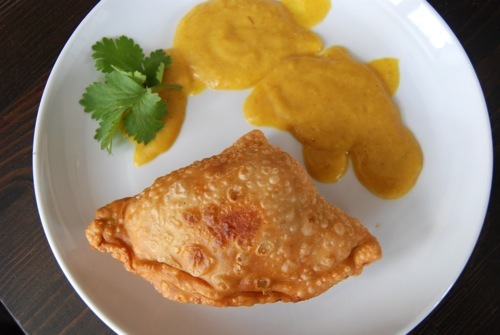 But its barely sweet taste and batter-like consistency were just too much to conquer. I will not be buying this again. 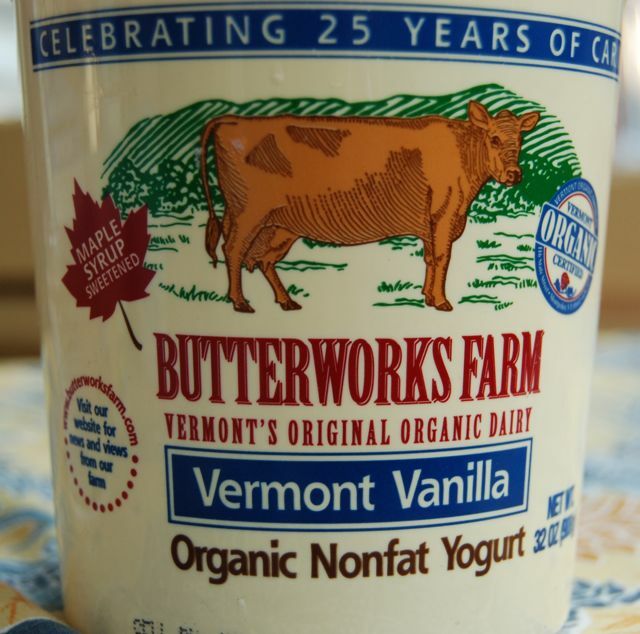 Knowing my predilection for ALL THINGS VERMONT, I was poised to love this yogurt like none other. Unfortunately, this was the only other yogurt – besides the EXPIRED ONE – that I physically spit out. I am sorry. 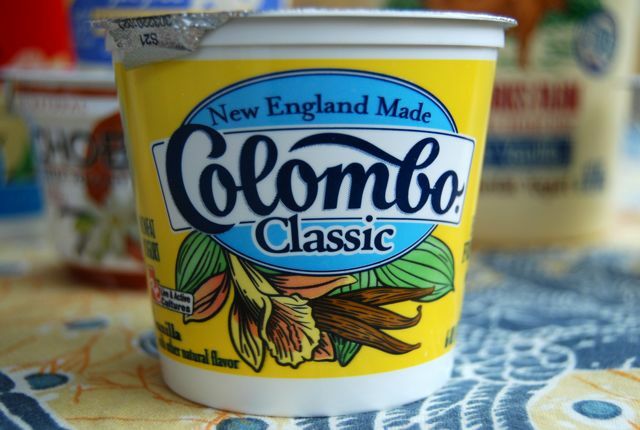 I feel terrible saying this about yogurt lovingly and wholesomely produced by a small family farm in the Northern Kingdom, but this yogurt is awful. Truly sour. AND Curdy. With no discernible vanilla flavor. Looking at their website, their Maple Yogurt seems to get high marks. Try that one instead. I normally LOVE BARGAINS. But sometimes you have to pay more to get what you want. This is one of those times. This yogurt was – shall I say it? GROSS. with a pronounced vanilla flavor that tasted fake. It was so nasty, I double-checked the fine print to see if it was natural vanilla. TWICE. I guess it’s the yogurt equivalent of buying a GUCCI bag off the guy in the street. Whole Foods may be a wonderful store, but frankly their yogurt has left me shuddering. First expired, then THIS. Good thing it only cost 59 cents. 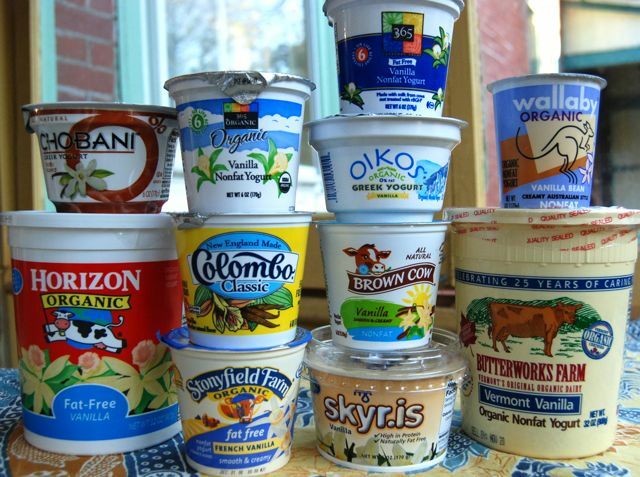 The GREAT YOGURT TASTE OFF! was certainly a learning experience. As someone accustomed to eating roughly 2 cups of yogurt on an average day – even for me, this was a little TOO MUCH. The difference in taste between these yogurts was nothing less than astounding. Now having sampled so many different makers, I realize just what I love about Stonyfield Farm and why I keep coming back. Although I liked Brown Cow and Colombo, neither is organic. 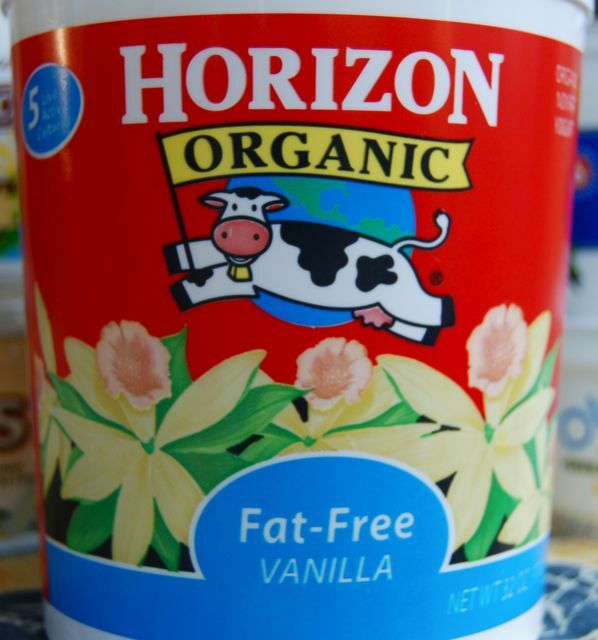 And although I also enjoyed Horizon Organic, I don’t like it any better than Stonyfield. In conclusion: there’s a reason why I’ve stayed with Stonyfield all these years. Healthy, delicious organic yogurt at a reasonable price.